Study Tour Wraps Up in D.C.
A four-day stay in Washington, D.C., that included visits to National Public Radio, Voice of America, the U.S. Capitol, the White House, major monuments, the Smithsonian Museums and the State Department concluded the SUSI-BSU on New Media and Journalism. While at VOA students talked with the VOA director, met with reporters who cover Indonesia and talked to a Ball State alum who works for the Uzbek service within VOA. Outside the White House, SUSI participants got a brief look at President Obama when police stopped traffic so his motorcade could speed by. 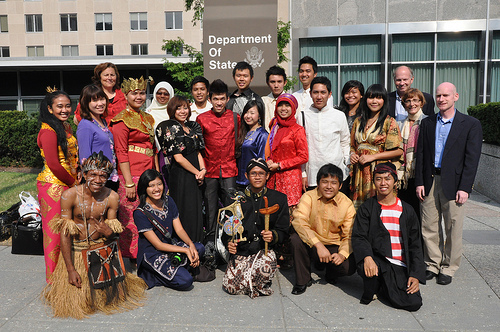 Another Washington, D.C. highlight was the “Around the World” presentation at the State Department, which allowed students to present cultural artifacts from their countries as well as meet other international students who were a part of other SUSI programs. A farewell group dinner at Buca di Beppo wrapped up the educational study tour. “Start spreading the news…I want to be a part of it, New York, New York.” SUSI students visited the Big Apple as the next stop on the educational study tour. Two days of workshops at The New York Times focused on new media and how the paper produces cutting-edge, multimedia content for the web. Top editors also talked to students about story selection for the front page of the paper. 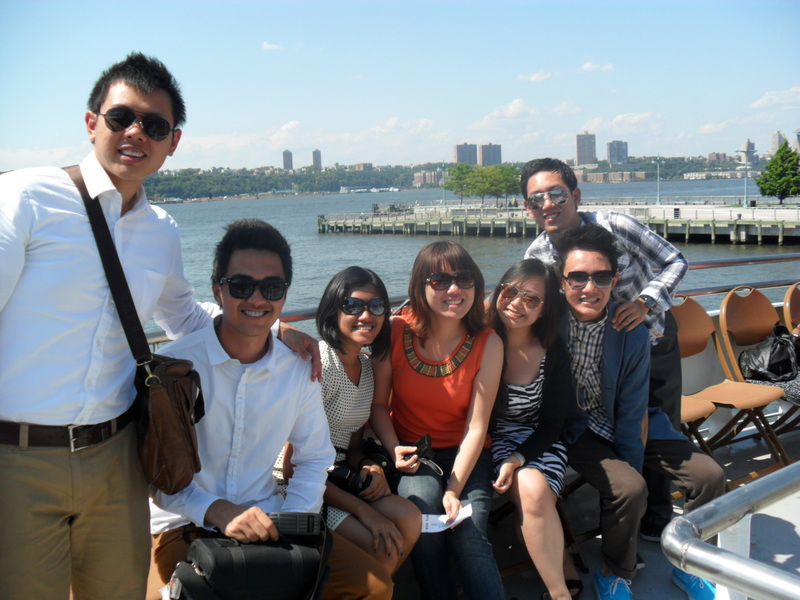 A cruise to the Statue of Liberty allowed students to experience New York from the Hudson River. A quick visit to Central Park included hot dogs and ice cream from street vendors and all attended a Broadway show — either Wicked, Lion King or How to Succeed in Business. The New York visit concluded with a tour of the United Nations, where the General Assembly was in session. The SUSI Ball State educational study tour began with a visit to Gettysburg battlefield – a field on which 51,000 Union and Confederate soldiers died during the American Civil War. Through a guided tour of the 6,000 acres and the viewing of an impressive Cyclorama painting which surrounds visitors, SUSI students learned about Pickett’s Charge and the impact it had on American history. They also heard U.S. President Abraham Lincoln’s Gettysburg address and examined other 19-century artifacts in a neighboring museum. An afternoon thunderstorm kept the students on the motor coach for part of the battlefield tour, but did not dampen spirits. The academic portion of Ball State University SUSI for Student Leaders on New Media in Journalism concluded with an awards dinner and ceremony in the David Letterman Communication and Media Building. Roger Lavery, dean of the College of Communication, Information and Media, thanked the students and faculty for their good work and contributions to the Institute. 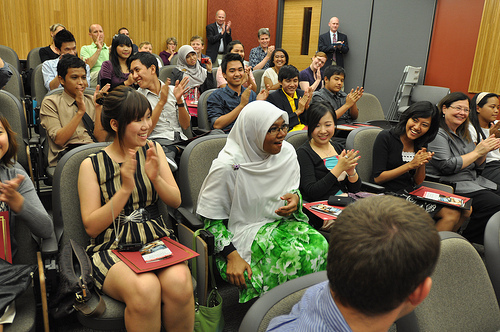 All SUSI students received certificates for successfully completing the program. Three students were awarded scholarships that will apply to online courses in Ball State’s Emerging Media Journalism Certificate. Students will spend an additional week traveling to Gettysburg, Pa., New York City and Washington, D.C.
An old-fashioned ice cream social on the Quad at Ball State University provided an evening of relaxation and a break from the final push to complete writing and reporting assignments before the end of the Institute on New Media and Journalism. 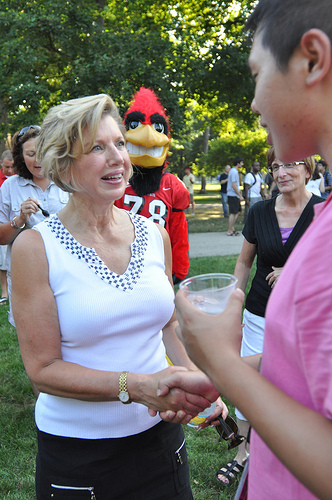 University president Jo Ann Gora greeted the stude nts and told them she was happy they had enjoyed their time on campus. 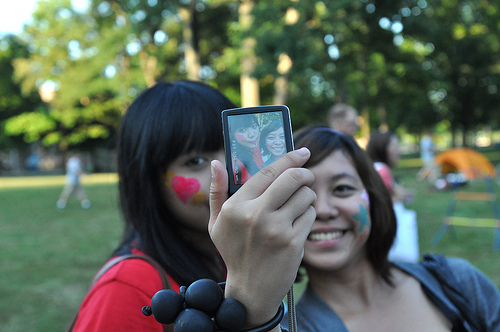 The event included live music by America’s Hometown Band and carnival games. Some students had their faces painted and clowned around with Ball State mascot Charlie Cardinal while others tested their strength by using a sledgehammer to ring the bell. The ornery, pizza-loving Garfield, a comic strip icon, welcomed SUSI students last week to the PAWS, Inc. studio of his creator, Jim Davis. 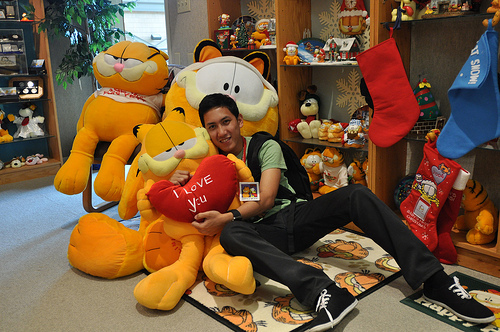 Garfield is the most widely syndicated comic strip in the world, according to Guinness World Records. Garfield has been featured in full-length movies and his likeness also appears on everything from baby clothes to cereal. Davis, who is a Ball State alumnus, oversees the entire creative and licensing operation from his studio northeast of Muncie. During the visit students learned about the strip creation and design process, and received a personalized autograph from Davis. A trip to the office of Muncie mayor Sharon McShurley (pictured, right) allowed SUSI students to learn about city government and the challenges facing city administrators. McShurley, who was elected in 2007, is the first woman mayor of Muncie. She said she originally didn’t expect to go into politics, but took the step when she realized she could make a difference. The stop at City Hall included a tour of the police department and a meeting with police chief Deborah Davis, who has been an officer since 1980. 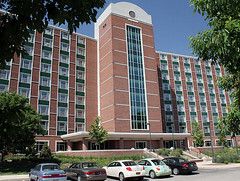 Students also saw a demonstration of police techniques. 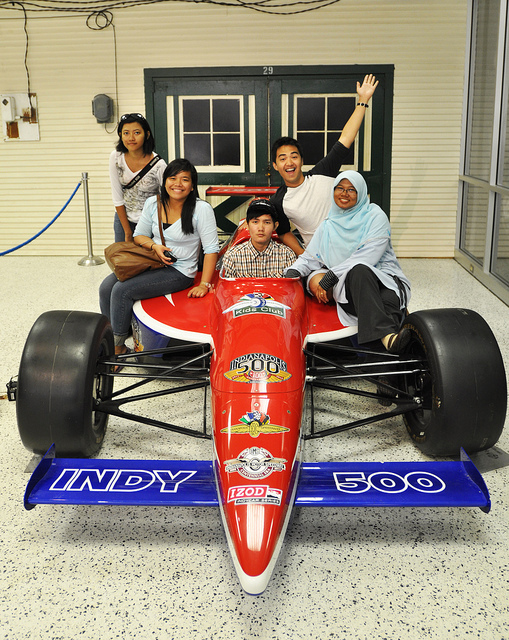 Indianapolis is known as the auto racing capital of the world and SUSI students experienced that first-hand with a trip to the Indianapolis Motor Speedway. The visit began with a ride around the 2.5 mile track that has turns that are banked at 9 degrees. Indy cars move at more than 230 miles per hour, but the students’ trip was more leisurely. Students then chose either to tour the Eiteljorg Museum of Indians and Western Art or Conner Prairie Interactive History Park. Of particular interest at the Eiteljorg was an exhibit titled Red/Black: Related Through History that shows how African Americans and Native Americans are closely connected. 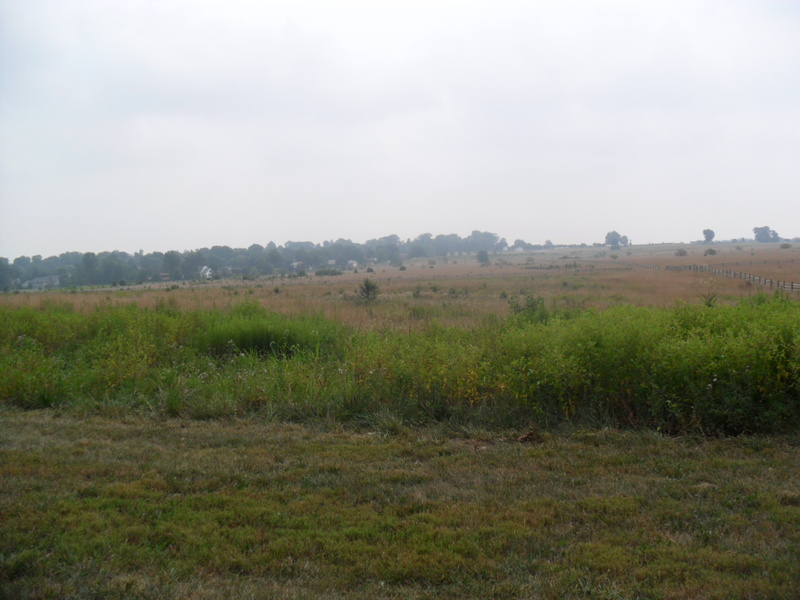 Those who visited Conner Prairie explored Indiana as it was in 1863 by checking out a reconstructed village and talking to interpreters who were dressed in period costumes. The bus also made quick stops at Lucas Oil Stadium, home of the NFL’s Indianapolis Colts and at Conseco Fieldhouse, where the NBA’s Indiana Pacers play. The stained glass dome and ornate architecture of the Indiana Statehouse were points of interest during a tour of the Capitol building in downtown Indianapolis. SUSI students also learned about state government and the Indiana Constitution as they toured the two legislative houses (House and Senate) of the Indiana General Assembly and the courtroom of the Indiana Supreme Court. 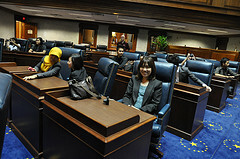 Since the legislature was not in session, students were able to sit inside the Senate and see what it might be like if they were elected officials. The day also included stops at The Indianapolis Star, the state’s largest newspaper, and WRTV television, the ABC network affiliate in Indianapolis. At The Star, editors, reporters and photographers talked about the paper’s current investigative projects, photo techniques and web-first approach to news. 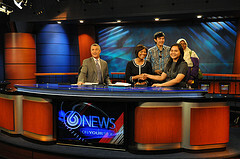 While at WRTV, the news director and manager of social media briefed the students on how television newsrooms work, then took them into the studio and control room to see a live newscast. Students also explored the Indiana War Memorial Plaza, home to the American Legion, in downtown Indianapolis. The on-site museum commemorates Indiana veterans. 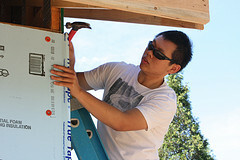 Habitat for Humanity welcomed SUSI participants this week to their latest building site. Students hammered and nailed, and even work ed in the crawl space to help get the house ready for its next family in need. Other students spent one morning at McCulloch Park distributing Second Harvest items to Muncie-area residents needing food. Dozens of people lined up to receive bread, cottage cheese, and necessities donated by local groceries. Students also used the opportunity to work on their journalism skills by interviewing organizers and volunteers, and taking still photos and video.